Compadres. I don’t want to alarm you, but I have become privy to some mind blowing information that might just change your entire life. I was talking to an engineer this weekend (yeah, I know, *yawn*) when it was brought to my attention that the year does not end in June. The calendar year as we know it, and have always known it, is a fraud. 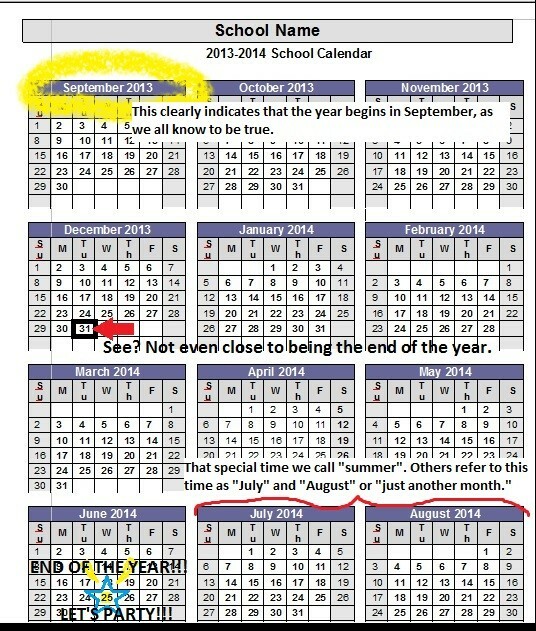 I am told, although I am still hesitant to believe it, the real calendar year ends in December. What!? “But how can this be true when the year begins in September? We all know that a year is 10 months long, not four,” I haughtily argued. Turns out, folks, the beginning of the year is not, in fact, September, but January. JANUARY! I mean, c’mon! What kind of conspiracy is this? Next they’re going to try and convince us that Summer isn’t even a real thing and that July and August are months just like any other month. Heresy, I say! Heresy! As evidence, I submit to you, a poorly designed jpeg. → Said No Student Ever.